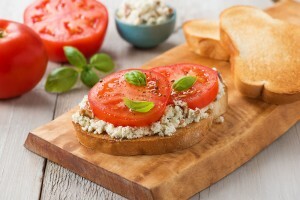 Bruschetta is a type of Italian garlic bread, the perfect foundation for all sorts of wonderful toppings. This version uses a blend of cheeses mixed with pecans, topped with fresh Florida tomatoes, and basil. Serve as an appetizer, with soup, stew, or pasta dishes. Use the best rustic country bread you can find. In a small bowl, mash the cheeses together with a fork, leaving the mixture somewhat chunky. Mix in the pecans. Preheat the broiler. Arrange the bread on a small baking sheet and broil the slices for about a minute on each side, just until golden. Watch it carefully so it doesn’t burn. Rub one side of each piece of bread with garlic. Spread some of the cheese mixture over each slice and arrange 2 or 3 overlapping tomato slices on top. Pepper the tomatoes lightly, then garnish with basil and serve.